Yes, you can remove any version of windows 8 installed on your computer, irrespective it is windows 8 release preview, consumer preview or windows 8 RTM or Windows 8 final version. In order to do this you just need to follow some simple steps and you can get rid of windows 8 without affecting data either on windows 8 or any other OS running on some other partition on the same computer. In case you would like to backup you user data and settings in windows 8, all the profile related customizations and data are by default backed up windows 8 if you are using a live or hotmail account in windows or in case you are using a local account or explicitly want to backup specific files you use the windows 8 file history feature, you can follow this guide to know how to do the same. If you follow the guide given below, there will be no need to backup the data on other partitions on other OS drives like windows 7 or xp as these partitions will not be affected when you delete windows 8 from other partition. Please Note: This method applies when you have installed windows 8 on a separate partition without affecting the windows 7 or vista existing partitions. First you will need to boot in any other OS which you have the same computer where you have installed windows 8, it could be windows 7, Xp or Vista and in order to boot you need to press the up and down arrow key so that you don’t miss the boot entry option in case by default your computer is booting in windows 8. 1. Once you are booted in windows 7 or other os except windows 8, go to start menu >> run and type ‘msconfig’ without quotes and press enter, you will see the system configuration after this, click on boot tab and then click the entry where you see windows 7 or other OS listed and then click the button saying Set as default if it is not already – so that next time computer boots up and find the boot loader of your old operating system to boot which should remain intact. 2. Now you can select the windows 8 entry – it could be with following names Windows 8 Consumer Preview, Windows 8 Release Preview or Windows 8 – select the respective entry and then click the delete button. After deleting the windows 8 os boot loader this way now you can open disk management. 4. Under disk management make sure to select the windows 8 partition only and then right click it and select ‘Delete Volume’ – now should format this partition so that there are no file left behind after the removal of windows 8 and this is also to make sure that you do the clean removal of windows 8. 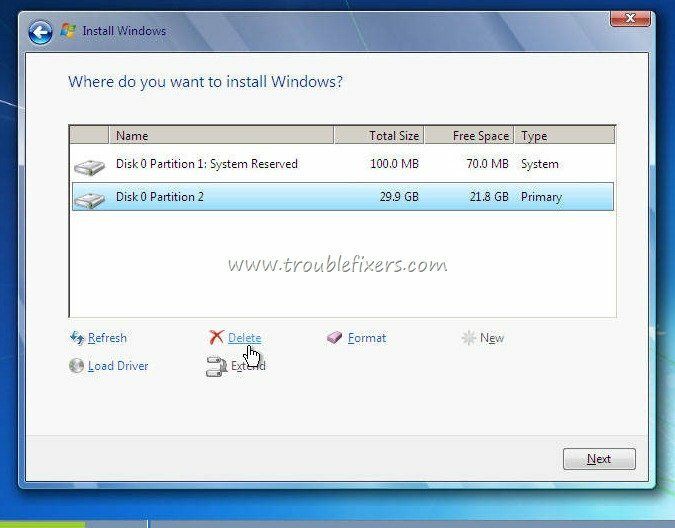 Now you will create a new partition which will be empty and now you can either use it for data or in future can again install windows 8 on it. 5. Reboot your computer, the windows 8 boot loader will be gone and you will boot and see the older boot loader again which you used to see before installing windows 8 and windows 8 is gone now. This method applies to those cases when you have installed only one OS that is windows 8 on a computer, in such case you just need to first backup windows 8 data and files on other drive on the same computer or to a portable drive. Once you have backup files you can easy boot the computer with a OS DVD or CD of your choice and during install – you can format the existing windows 8 os and install older or newer version of windows on the top of it by simply deleting the existing OS on that drive. If you like this article or this article helped you, please clikc the +1 Button below to recommend this article.